Organization may have no finer ally than the humble basket. 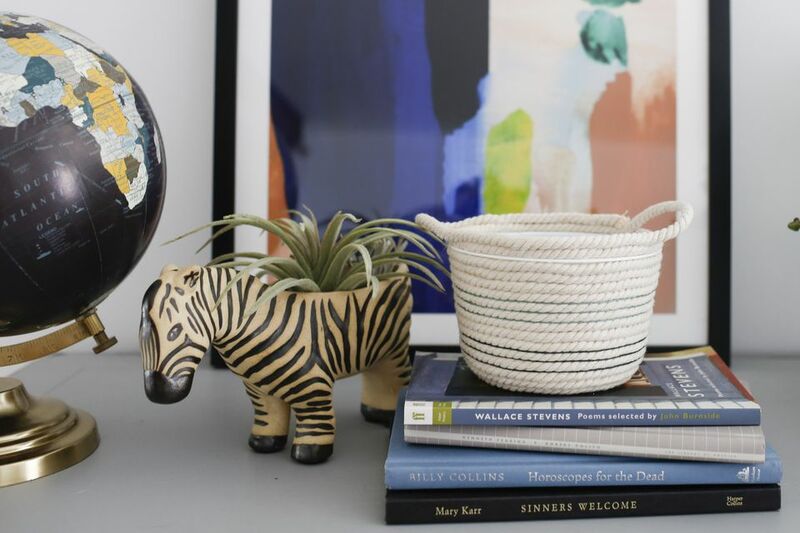 Not only do baskets help hide and corral your stuff, they look pretty cute sitting on your shelves too. The only problem is that sometimes getting the look you want can be pricey. 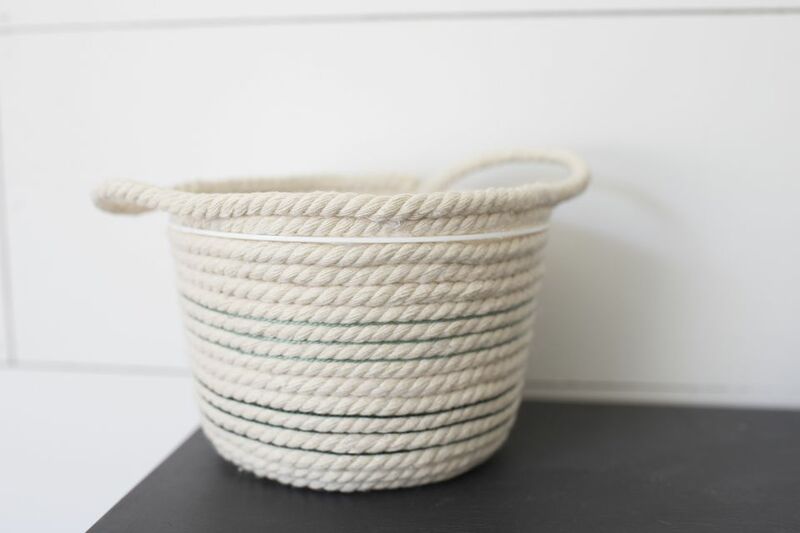 And these simple rope baskets are no exception. These colorful baskets add a touch of nautical style and a playful hit of color to any coffee table, counter, or shelf they’re placed on. Here’s an easy way to make one (or more) on your own. Spoiler alert: it doesn’t involve any sewing! The most important thing to keep in mind when you’re choosing your supplies is the type of rope you’ll be using. Synthetic rope won’t look as good as a simple white or off-white cotton rope will–plus, it can be harsh on your fingers if you’re handling it. You’ll also want to be aware of how thick the rope is. The smaller the basket, the smaller the circumference of the rope should be. Likewise, a larger basket would require a larger rope. Starting on the bottom of the plastic container, glue the rope in a swirled pattern using the hot glue. You’ll want to be liberal with the hot glue to make sure the rope stays put, especially on the bottom. Eventually you’ll get to the edge of the container where you’ll need the rope to work its way up the sides. Put dashes of hot glue right on the container and stick the rope to it. Slowly work your way around the outside of the container. This is the part where patience is really needed! Try to rush and you could end up with a basket that is covered in excess hot glue. Just take your time and work carefully. And be careful that the hot glue doesn’t burn your fingers! One method for creating rope baskets uses embroidery thread to sew the pieces of rope together. It adds pretty colors to the basket, but can be more challenging for someone who isn’t comfortable sewing. You can also make a basket using a sewing machine, but again, we wouldn’t recommend that technique unless you’re comfortable with a sewing machine. Since we’re making use of a no-sew technique, you can still get the added color from the embroidery thread without having to sew it. Start by tying the end of a piece of embroidery thread to a piece of the rope. Twist the thread around the basket and in between the rope so it’s circling the basket in evenly spaced gaps. Continue until the amount of rope you need is covered. If you want to do more than one color, just cut the thread and tie your next color onto it and continue twisting. Once you have enough rope covered to get started, you can tie the thread to a piece of rope until you can see if you have enough to cover the bowl. Once you get to the top of the plastic container with the rope, you’ll want to add decorative handles on each side. On the last layer of rope, as you’re gluing it to the piece of rope below it, you’ll want to leave a handle sized gap in the glue on both the right and left side of your bucket, then continue gluing on the other side of the handle. Since the rope you’re using should have a slight stiffness, the handles will stand up on their own. Note: Remember that these handles are decorative! We wouldn’t recommend filling the basket with anything heavy and expect to be able to pick it up by the handles. After the handles are on, you’ll want to cut any excess rope and glue the end piece on the inside of the container on the back side. Do your best to hide it but don’t stress about it showing. How easy was that? And it's a craft with a recycled material, no less! While you might be skeptical about using a plastic container on the inside, it actually ends up being rather helpful. If you’re using it for perishable items that can rot, the plastic will protect the rope from getting stained or damaged. You can simply wipe out the inside plastic container if need be. Clever and cute!